Snow, ice, sleet, fog, gale force winds, rain, more heavy snow; only once in the mid 1980’s do I remember anything like this in South Devon. Thick snow, huge drifts and frozen pipes, and here we are again, a second year running, early frost followed by ice and snow and it’s only December. For nearly thirty years we have lived in this valley unthreatened by harsh weather. Winters are mild; grass usually continues to grow, slowly of course and sugar free, throughout the coldest months. 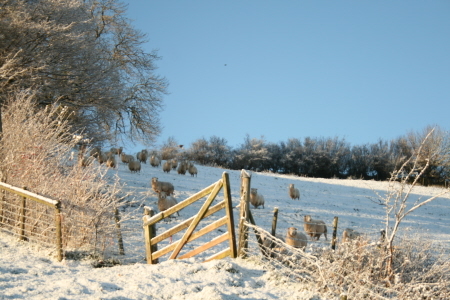 Our hardy Dartmoor sheep graze happily on the hills all year round. OK, yes, we West Country people are very spoilt, and that’s why we stay here. My neighbouring farmer flagged me down on icy roads last week to pass the time of day. Chatting in the lanes is a local tradition. “Alright?” he says, a local greeting. Alas, next day more heavy snow fell here. What has happened to that Gulf Stream that’s supposed to whirl so warmly round us and keep the west coast of the British Isles safe from Canadian winters; we do share the same latitude, oh dear. The Gulf Stream has been responsible for rendering us our mild weather in this, our southernmost British peninsular since time began. Where has it gone? Pondering, I Google Gulf Stream. I am told this warm Atlantic Ocean current, one of the strongest in the world, starts in the Gulf of Mexico, bringing warmth northwards towards us, as it flows past Florida driven by the prevailing south west winds. As it flows north the warm water evaporates and becomes increasingly salty. In the north Atlantic the warm water meets the Artic cold, the heavy salt water sinks forming a deep current which sets up a pulling mechanism splitting the Gulf Stream and drawing it to the north west coast of Africa and towards the western part of the UK and Europe warming us and thus stopping us experiencing our rightful lot of those icy Canadian winters. Are you with me so far? I think I’m somewhat out of my depth. Now, some scientists say Global Warming is causing the melting of the Arctic and disrupting this pattern and, ironically, causing colder winters. 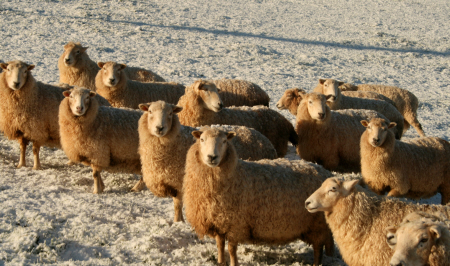 The science, I have to admit, is hard for me to grasp but as I tramp unaccustomed, across fields of ice and snow, lower buckets into an icy stream, stamp on frozen water troughs hoping to release just a tiny trickle for the sheep and donkeys, I know something is afoot. It just isn’t usually like this! 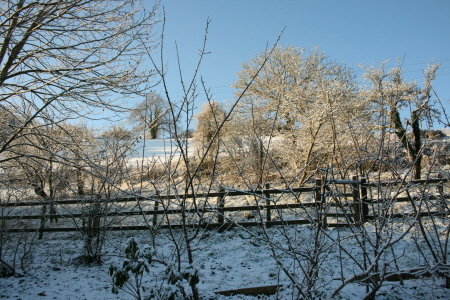 The valley is transformed into a sparkling white alien wonderland backed by an azure sky, bathed in the golden glow of a low winter sun which, in turn, casts wild distorted shadows on the ground. 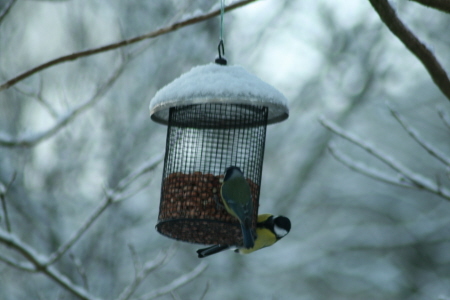 A flock of Redwings are feeding on frozen windfall apples and Bluetits jostle for the bird feeders. 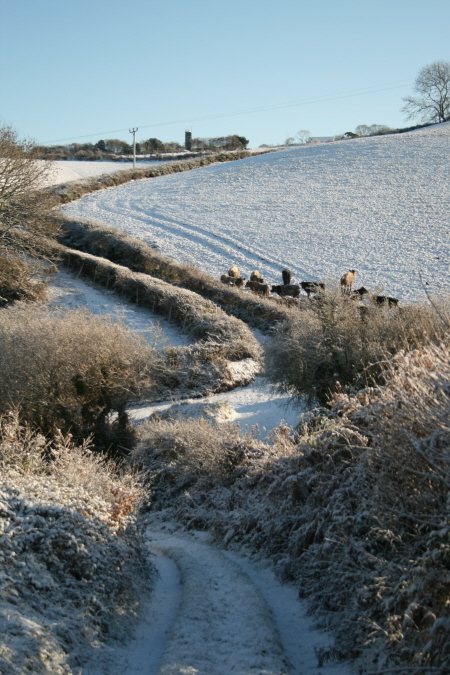 The farmyard is an ice rink, the lanes resemble the Cresta Run, most of the villagers are snowed in at the bottom of steep South Hams hills. I watch children hurling themselves down a neighbour’s field on a wobbly toboggan. Suddenly the sun vanishes, the sky turns black, a north easterly wind swings in across the hills bringing yet more snow. Even the dogs look dejected as we slide down Steep Field into the valley. After such a dry summer, hay and straw prices are at a premium so careful feeding is essential; no margin for waste this year. 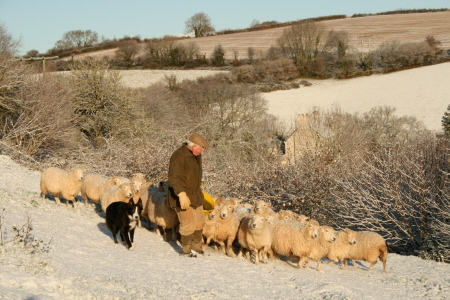 Today we brought the ewes down from the top of the hill to Sunday Orchard, the big steep field nearest the farm yard. So enthusiastic were they, they nearly had us off our feet. 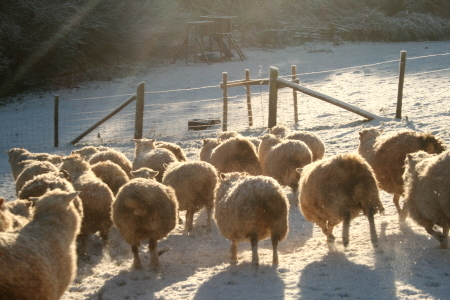 From here we will feed them every day and keep them in tip top condition till lambing starts on St Valentine’s Day. Well done Chris, our handsome Whiteface ram. Having given us wonderful lambs for the past two years, he will go to pastures new this year so that we may introduce new blood and avoid in breeding. 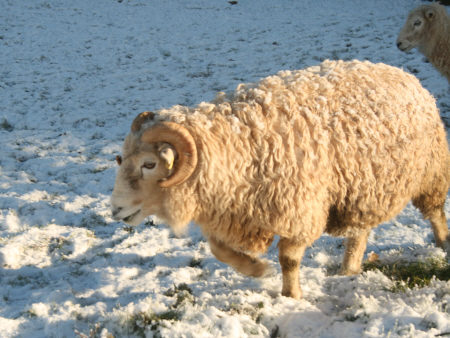 We will miss such a gentle chap so expertly bred and raised by Claire Butcher, our Whiteface Dartmoor chairman. Meanwhile up the road, the brown crossbred ewes are with our home grown ram, the grumpy Cliff. His fate rests with the configuration of his progeny; I fear his temperament might influence his future. I am always amazed at how quickly our lamb sells. Once they have tried it, people love it and keep coming back. Whiteface Dartmoor sheep are an old fashioned breed and the lambs mature slowly. They reach maturity much later than commercial breeds. This has its drawbacks; we must keep them and feed them for longer. 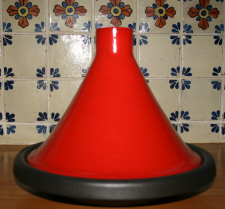 But the result is meat with the depth of flavour of mutton without the fat; rich dark tender meat.